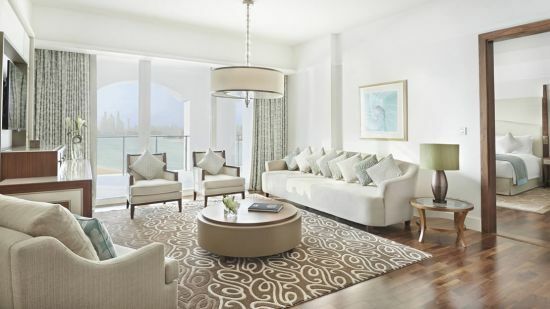 Beautifully elegant and luxurious, Waldorf Astoria Dubai Palm Jumeirah is a tranquil haven in the midst of vibrant Dubai. 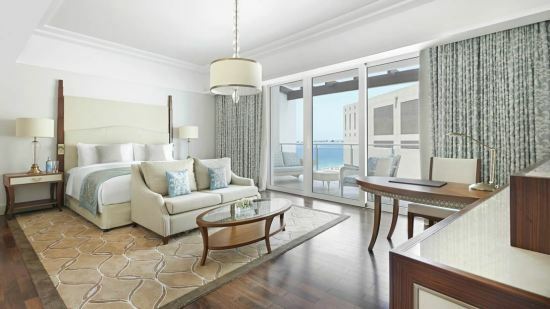 Located on the world-famous Palm Jumeirah Island, astonishing luxury, premier facilities, and unparalleled services combine to create a truly pleasurable stay for families and couples. Relax amidst a private beach, or in the exquisite Waldorf Astoria Spa. There is exceptional rooms and suites and an array of fantastic sports, leisure and kids' club activities. There’s over 200 metres of pristine beach, with water sports and decadent temperature-controlled swimming pools to enjoy. Indoor amenities include a Venetian-inspired bar serving aperitifs, dining experiences created by a Michelin star chefs and superior venues for celebrations, and business occasions. 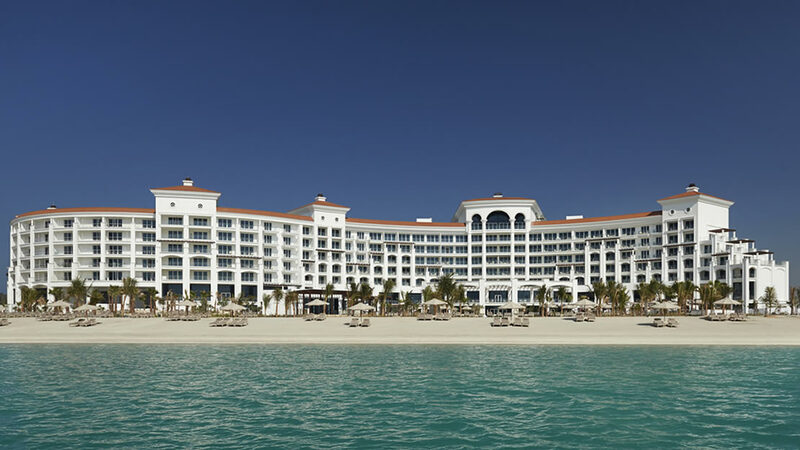 Waldorf Astoria The Palm has 200m of silky-soft sandy private beach as part of the resort. 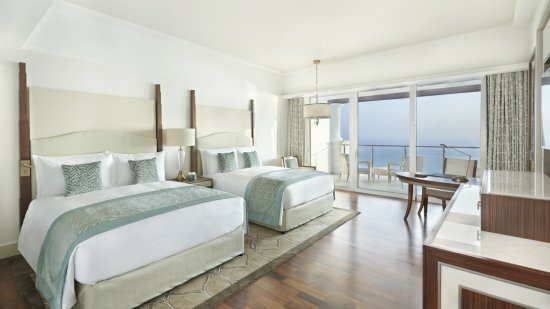 This stunning 5-star resort is located on the east crescent of famous The Palm Jumeirah Island. There’s numerous restaurants and bars to try out during your stay, and a multitude of facilities. If you do fancy venturing out, Dubai Marina is 15km away for boutique shopping, cafes and restaurants, and the Emirates Golf Club is 17.5km. Downtown Dubai for more shopping and the iconic Burj Khalifa is approximately a half an hour journey. Aquaventure Waterpark is a fun-filled day out, just 4km away at the tip of The Palm. Dubai International Airport is approximately 40km away from Waldorf Astoria The Palm. 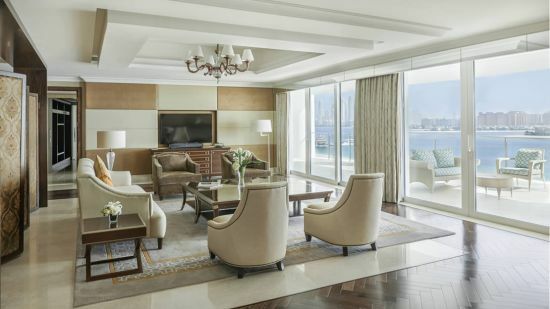 These rooms boast either views of the iconic Palm Jumeirah or of the spectacular Dubai skyline. There's a stylish marble bathroom complete with double vanities, walk-in shower and separate bath. This class of accommodation has access to the added benefits of the Waldorf Astoria Lounge. 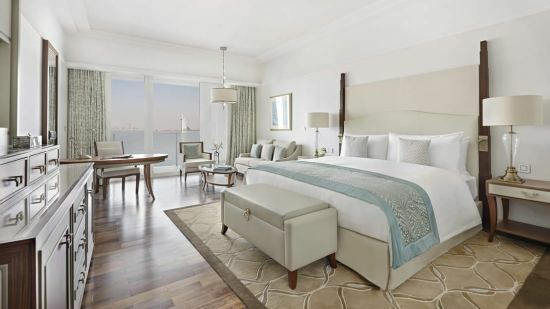 Featuring stunning views of either the Arabian Gulf or the Dubai skyline, there's a seating area, work desk, spacious walk-in closet and a plush signature Waldorf Astoria bed. These rooms are perfect for those who want to get out and explore Dubai whilst still retaining all of the luxuries of a superior accommodation. There are partial sea views from the exquisitely furnished balcony and intimate design features throughout. 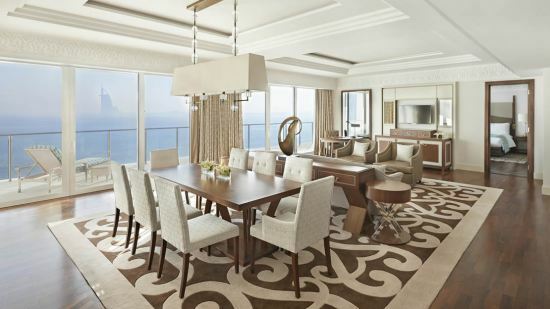 A beautiful space incorporating the decadence of a Waldorf Astoria approach with separate living and bedroom, large balcony looking out over stunning Gulf views. A signature king-sized bed, marble bathroom with lavish fixtures, and all of the general amenities complete the stunning design features. Epitomising luxury with a fabulous space with an opulent dining area, balcony, lounge and private bedroom. The experience is enhanced by Waldorf privileges, including exclusive lounge access and stunning views of the Arabian Gulf. Unparalleled luxury is evident in this residential-size suite that's simply brimming with superlatives. Featuring a complete lounge, kitchen and dining area leading onto a private office. Two exceptional bedrooms open out onto a balcony where spectacular views can be enjoyed. In addition, you'll have access to the Waldorf Astoria Lounge with exclusive privileges. World-class 3-star Michelin chef Heinz Beck has taken the elements from contemporary Italian cuisine and created an exceptional menu of innovative dishes, a real treat for his guests. A stunning poolside restaurant, guests can enjoy a plethora of dishes influenced by the Mediterranean and complement them with a refreshment from the bar. A famed tea lounge in New York City, classic afternoon teas, cakes and pastries can all be enjoyed here. Fabulous South East Asian cuisine is served here in a contemporary setting. Inspiration from the New York City scene blends beautifully with the expertise used to create exceptional cosmopolitan brunches. Live entertainment also complements the experience. Delectable brunches New York-style feature at this superb venue. The rich and vibrant flavours of Arabic cuisine can be enjoyed at this stylish and elegant venue. Breakfast, lunch and dinner buffets also combine a wealth of international cuisine. Please note that children aged 12 and over are welcome at the Waldorf Astoria Lounge from 17:00 onwards.